I am sad to report that my last-minute campaign during Washington’s primary last week was unsuccessful. I lost my bid to become the Evergreen State’s newest Commissioner of Public Lands. What’s that? You had no idea I was running for public office? Neither did I, right up until the day of the election. My coworker, Kimberly, was filling out her ballot and asked if she could add my name as a write-in candidate. “For which position?” I asked. “How about Commissioner of Public Lands?” she replied. “Go for it,” I said, figuring my love of nature and the outdoors made me at least as qualified as the other candidates. So she did. And just like that, a budding political career was launched. 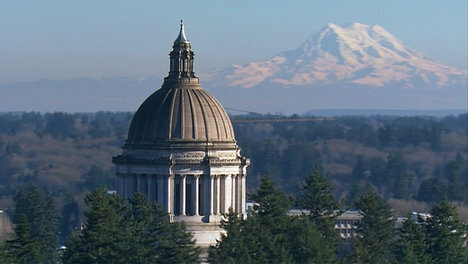 I’ll admit, “running for public office” wasn’t something I’d planned on doing when I awoke on Tuesday morning, but by the end of the day I was all in, especially after Googling “Commissioner of Public Lands” to find out just what the heck I’d be responsible for doing and saw the six-figure salary that accompanies the job. That afternoon I hit the campaign trail – which means I made a circuit of the office – asking my coworkers if I could count on their support. None of them even knew I was running. “What’s your position on the issues?” one of them asked. “I am ‘pro’ the good things and ‘anti’ the bad,” I said. Whew! I really dodged a bullet with my quick thinking there. Gotta keep my constituents happy, you know? “Yep. You’re a politician, all right,” came the cynical reply. Politics does run in my family, as a matter of fact. My grandfather’s-sister’s-husband (got that?) was mayor of Ewing Township, New Jersey, back in the 60s. He’s even got a memorial park named after him. It’s practically my birthright, see? As the returns trickled in, it quickly became evident I would not be packing for Olympia. The race is going to come down to Steven McLaughlin and Hilary Franz instead. I blame it on my lack of campaign buttons. I am nothing if not gracious in losing, and plan on officially endorsing Hilary, of course. I’ll schedule a news conference soon. 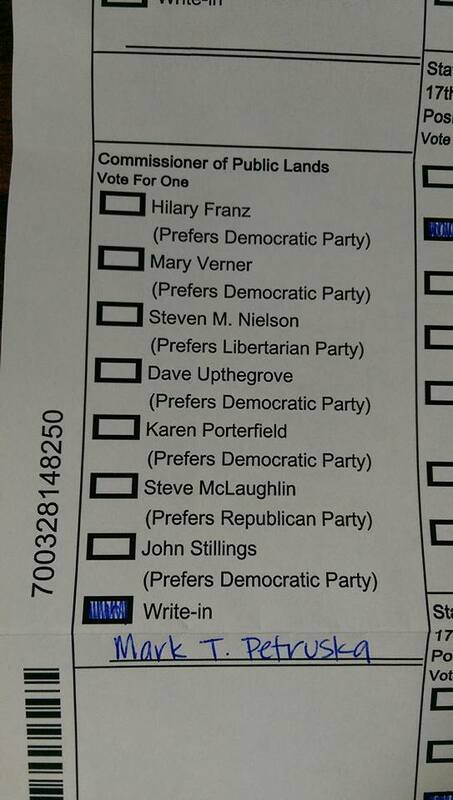 At least I can honestly say my name was on the Washington state ballot this year, and I received vote. Not votes, mind you. But you know what? I got one more than anybody else in the office did! And come 2020, I plan to throw my hat in the ring a lot sooner. Well, that’s a shame. You could have googled the ugly pasts of Steve and Hilary and just make the campaign about that. At least that’s what everybody else does. This is probably why I didn’t win. I’m too damn nice! You’re a punny guy, Carl. We would have voted for you if we had known! I can’t believe my own mother didn’t vote for me…! Yard signs. Next time you should really have a staff to make yard signs. I’d volunteer? Plus, I have lots of cardboard boxes that I’d be happy to contribute. That’d be swell, Ms. Briggs. I really could use some volunteers to canvas the neighborhood. Thanks for your support! Mark, that cracked me the hell up!!!! Damn, I wish I would have known about your running, I would have definitely voted for YOU! You’d have to move to Washington first and establish residency. If you’d do THAT for lil’ ol’ me, Ron, I’d be forever thankful! Commissioner of tourism does have a nice ring to it. Thank you in advance for your support! Sorry to hear you didn’t win. I’d been one of your biggest supporters since the first paragraph. Well I am sorry you lost the election you didnt know you were entering but congrats on the quick thinking and getting the most votes in the office! Next time I’ll be better prepared. That’s a promise!